Club Penguin Cheats by Mimo777 Club Penguin Cheats by Mimo777: Jet Pack Guy Finds Suspicious Device! 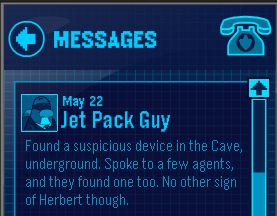 Club Penguin's Jet Pack Guy and others have found a suspicious device! There's also a new pin in the boiler room. Just put your mouse on the pot with the boiling stuff on top of the pin maker sign. It took Jet Pack some time. I have a theory that Herbert is going to attack in a few days. Hey, this is based off of a completely random guess, but I think that Herbert might strike before the party is over. Sources are telling me sometime during N*XT week. Wait wait wait! There's a device? Hey carl has invaded party rooms. when i go to a room it says loadind stair diemension or space, candy, or strange diemension. Attention all EPF agents. An anonymous source has revealed when Herbert will attack, be ready this week. MUAHAHAHAHA.... Um, I mean I can't wait till we finally capture that evil genius. If you play bits and bolts during it it becomes members only at level 3-4. i fell Sorry to those non-members. Hey Mimo, just thought I'd let you know that there is a pin at the Dojo, but its not allowing me to get it "This item is not currently available" Is what it said. hey can anyone is able to find the device in the cave? -----------------------------------Hey i noticed that too! Kinda weird huh? Also at the start of the party, most of the rooms were classified as Party room 13 or Party room 22! Umm... why can't he TELL us what the device is?? Then we might have a clue what it is? PS: I actually like Herbert, he's furry and cute!! I could be the switchbox, but it said in the CAVE, which is where the 3 quests are. I think its in the gold somewhere. And the Switchbox 3000 was there last year, and the year before. yea ! it's suspicios !! !